Two well-known names CMI Group , USA and Dalal Engineering, India have come together to offer perfect solutions in the field of Solvent Recovery. So you get the benefit of CMI’s established technological expertise and Dalal’s proven engineering skills. CMI is a recognized leader in the fields of vapor phase solvent adsorption using activated carbon and solvent recovery. It has over 80 years of worldwide experience, and with thousands of systems in operation, helps companies recover millions of kilos of solvent/ VOC’s each year. Known for its conservative engineering, quality equipment and services, and seasoned team of engineers, CMI provides design, engineering, equipment and installation of recovery systems, using activated carbon or zeolite adsorbents for solvent recovery and VOC emission control. CMI’s plants are high performance, cost efficient process systems that meet each client’s individual requirements. 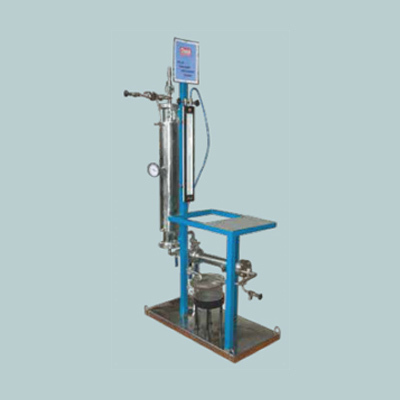 Dalal Engineering is a well known company that offers a variety of techonologies and machines to the various industrial segments. Our highly qualified team of trained engineers and partnerships with global leaders enable us to provide cutting edge solutions to the industry. Continuous innovation and advancement has been a hallmark of Dalal Engineering. Our workshop near Mumbai is 5000 sq. m. large and has a work force with a cumulative experience of over 1000 man years. At Dalal, we don’t sell machines, we provide solutions. Once you are a Dalal customer, we are completely at your service. So whether it’s a spare part you need or an entirely new machine, we are always there for you. International cutting-edge technological solutions that are the most advanced in Asia. Superior process know-how, speedy execution, and exemplary after-sales service. 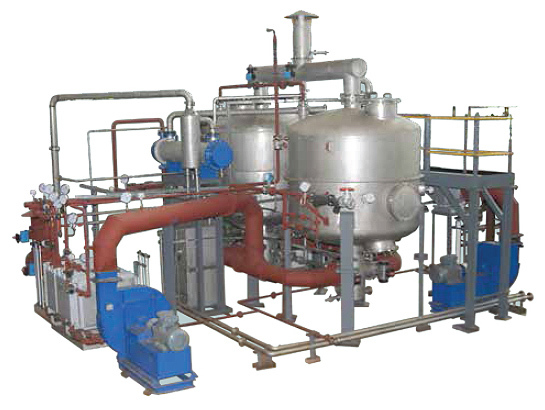 Dalal Solvent Recovery Plants are designed and constructed to the highest engineering standards and offer guaranteed performance. They provide continuous 24 x 7 automatically controlled operations both for large specially engineered installations or packaged units requiring only to be set down and connected to services. Dalal can recover solvent with up to 97% efficiency and eliminate air pollution hazards at the same time. The purity of the returned solvent is guaranteed. Dalal also offers a complete engineering service including detailed surveys for the evaluations of the economics involved in recovery and reuse of your solvent . 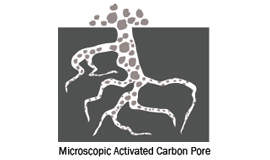 Dalal uses the adsorption power of activated carbon (about 1,200 m2 of surface area per gram) to recover organic solvents. The Solvent Laden Air (SLA) is conditioned (filtered and treated for temperature and humidity) prior to adsorption by passing it through the SLA Cooler (2) and SLA Re-Heater (3). Recovery begins when the SLA Fan (4) passes the SLA through Adsorbers (5) of packed-beds of activated carbon. 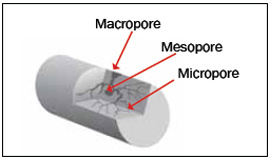 The solvents are retained in the activated carbon pores and the cleansed air is discharged into the atmosphere. Through staggered adsorption and desorption cycles monitored by analyzers and computers, each bed is periodically regenerated by counter flow of steam or inert gas that heats the carbon. 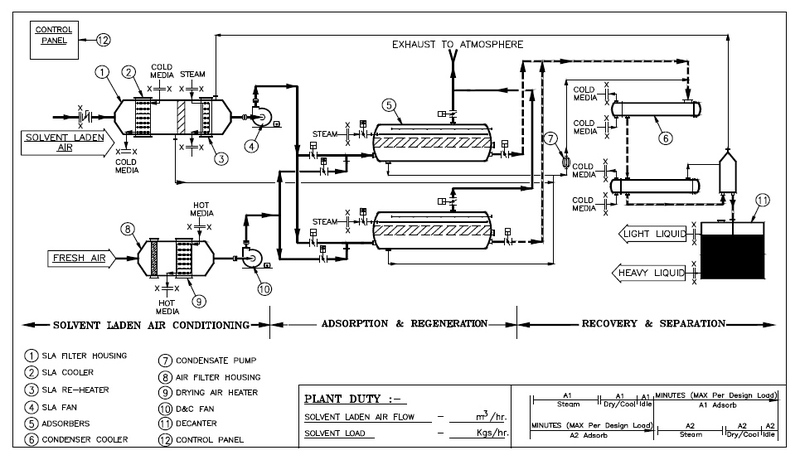 During the regeneration phase, the solvent vapors are released from the carbon and carried by steam or inert gas to condensation (6), decanting and solvent treatment units. Solvent treatment systems are custom designed to meet each client’s requirements. Decanters (11) are used for separation of solvent which are non miscible in water. Other cost effective processes and equipment include air stripping, steam stripping, and steam distillation. Additionally the recovery efficiency can be improved by providing a Drying and Cooling unit (8,9, 10) after the regeneration before the next adsorption cycle. With specific reference to those solvents most used and recovered industrially. Suitable for range of air flows, variety of solvent types, and solvent loadings Very high emission control and recovery efficiencies of 95% and above. Fully automated systems including PLC operations result in minimal manpower to operate the plant following full safety precautions. 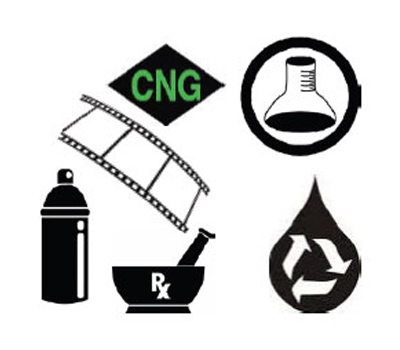 Reuse of solvent reduces manufacturing costs resulting in attractive Pay Back Periods of about 2 years. 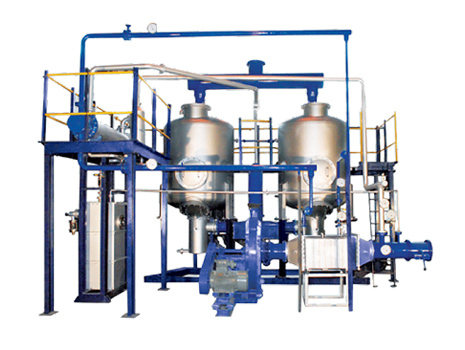 Packed bed Activated Carbon Solvent Recovery Plant helps comply with environment pollution control. Helps combat global warming by recycling and reuse of natural resources. We have now created a skid-mounted, scaled down working unit of SRP which can be carried to any site to conduct trials. We will also provide Installation, Commissioning and Training services for this plant. The trial can help a company determine the feasibility of capturing volatile organic compounds.